The Sphynxes are among the most powerful spirits in service of the Countess. 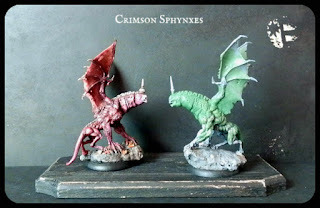 And probably the most impressive-looking models in my Malifaux crew - being all big and red and winged. I play them as Shikome- incredibly swift heavy hitters. They usually choose one enemy model as their prey and proceed to hunt it down until it's dead, which they can also do very successfully in pairs. As with Onryo and Gaki, Kirai is able to summon them. On to the actual miniatures. As the maximal number of Shikome I can field is two, that's how many I intend to make. The left one is completely finished, and the right one is still waiting for a paintjob. 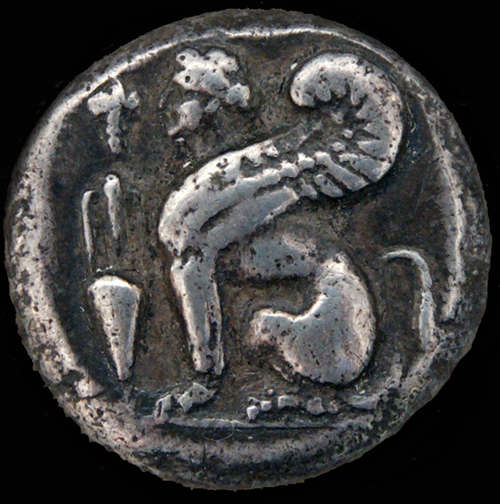 As you can see they possess features of both the mythological Sphinx, as well as draconian ones. 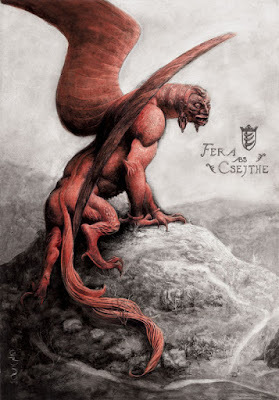 I tend to call them sfinga (sphinx) , but some of the members of my gaming group call them zmaj (dragon). The design was inspired by an illustration Santiago Caruso made for the book La Condesa Sangrienta by Alejandra Pizarnik. It was really cool that Rackham's Tiger of Dirz miniature stands in nearly the same pose - obviously I used that mini as the base. The wings are from Tyranid Gargoyles. Copyright Santiago CARUSO © 2011 Used without permission. By the way, you should definitely check out Mr Caruso's website. His illustrations for the La Condesa Sangrienta (Bloody Countess) book are terrific, and have provided me with tons of inspiration for this project. Of course, the rest of his work is awesome as well. Great looking proxies and I agree - Caruso's works are pretty amazing. Haven't heard of him before but the works are really dark, I like his style. I am in awe... You have wonderful sculpting skill... And the paint job really brought the first sphinx to life. 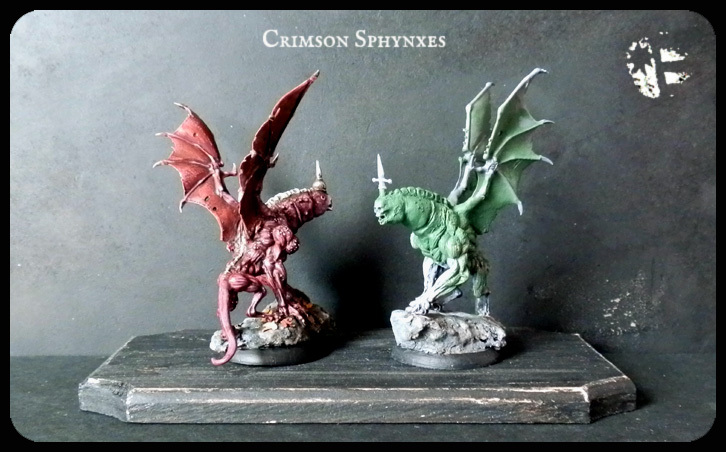 They both look great, but the second unpainted one is my favourite since it has a more menacing look. Leather wings look much better on it than those feathery ones in the concept art, or inspiration art, whatever. The only thing that I would point out is that Dirz tigers don't have a tiger like tail and in stead of a tigers one that looks a bit like a lizards tail (and in the Santiago Caruso the picture it isn't a lions tail and something else furry tail like - more like a medival looking lion sculpture). 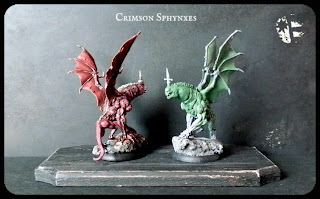 How did u paint crimson Sphynxs red flesh?